I’ve resisted the Chrome buzz so far, but today I’ve fallen too. Even though Firefox is somewhat sluggish in comparison to Chrome, I like its multitude of extensions and frankly, I’m just used to it. So my workaround was Chrome (haven’t switched over as a main browser though). What’s most annoying is I’m sure there was a way to do this, because before I switch computers a week ago I was able to view the raw feed – I just can’t remember how. I finally really settled on Google Reader instead of a desktop feed reader. The advantage of being able to read RSS everywhere without any hassle outweigh the downsides. Also I get the benefit of easily exporting a Feed of Shared Items (both RSS and Email. In addition, here is a link to all previously shared items. 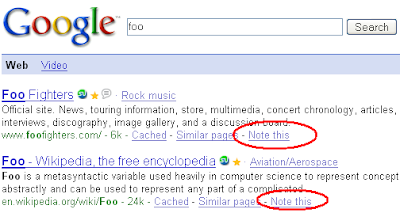 If you’ve recently Googled you may have seen the “Note this” added to every link. It’s a useful new very useful. Upon clicking it copies the current content of said web page into your Google Notebook, a cool service that organizes your web clippings. It opens up right on your search result page and has a full page interface as well. If you’re doing any non-trivial software assignment with partners, you should consider using source control. So far, I’ve used source control for large projects of course, but never in an assignment from Technion – back when I was an undergraduate student I was largely oblivious to source control and I didn’t take any programming courses in my 2nd degree – until now. Now I actually have a few non-trivial homeworks at Managing Data on the WWW (writing an http proxy is one of them), and so far I didn’t take up the trouble of setting up a source control. Well, it appears it is no hassle at all, at Unfuddle you can setup a project page, SVN server, RSS and email updates on checkins, project management and more in less than 5 minutes and no cost. Unlike some alternatives, putting your code there doesn’t mean it’s now open source and free to the world, you get control over who accesses your code. Like or not, I find myself using Facebook, reading stories and rating articles “I Like” or “Dislike”. I would rather read this feed in my RSS feed then log into FB constantly, but then I lose the ability to rate stories. How about a supplement to the RSS standard which would allow a user to vote on/rate articles, tag them (not just locally in his feedreader), and generally send information back to the RSS info supplier? I’m guessing this might benefit both content supplier and user. In said Facebook example, today if I have a smart enough RSS reader maybe I can rate articles, but this rating is separate from Facebook’s internal rating system. My quest for the holy RSS grail continues. I tried Google Reader and several other web based feed readers, and they’re just not convenient enough. I am addicted to feedreader. A new version of it does support synchronization to some specified location, which is sort of what I wanted. But now I am hindered by my poor upload speed, and find that this synchronization is extremely slow. I turned to look for U3 solutions – just install some reader on my U3-enabled USB disk. Guess what? There is no U3-compliant RSS reader (if you don’t count Mozilla Thunderbird, which is too cumbersome). Feedreader claims to “work with U3”, but it doesn’t. Finally I read in Wikipedia that the U3 format is about to become obsolete, just two months after I bought it. First of all, Bee Movie is a good one. Second, you can view my movie preferences at this page or stay updated on them by this RSS feed. Third, regardless of my preferences, you should use MovieLens to recommend you of new movies matching your taste. It’s a simple recommender system for movies. For me, the link for my movie recommendations does not work on Firefox. It does work on explorer, and the entire site works well on Firefox. Weird. I’m seriously thinking of switching to Google Reader (from Feedreader). Ability to check feeds on other computers, instead of pile up a large chunk of feeds to check at night. Ability to quickly mark favorite posts so my readers (you) can get them, instead of having to write a separate post for every post I like. Cons: Not having a popup on a new item (which can be a boon during movies). Comments Off on Switch to Google Reader? Why is Open Source so hard? Today I came with with an idea for a cool feature for RSS clients. What I want is intelligent filtering like StumbleUpon – users would click “I like it” or “I like it not” on RSS items, and the client could learn a user’s “taste” and prioritize future items. Google revealed someone just thought of this about 2 weeks ago. Still, I don’t want to pay 20$ for an RSS reader, and I don’t want a reader that specializes in this, I want this as just another feature of a standard RSS reader, so I went on to try and add this to some existing open source RSS client. I immediately found NClassifier, an open source .NET text classifier. Looks promising. For an RSS client I mainly found Rssbandit. A bit ugly, but I could work with that. I figured the SVN version might be different from the CVS, so I went back to my efforts to use TortoiseCVS, and succeeded … to connect. In SVN, I could just get the entire latest version. In CVS, I had to choose “packages” to download. Trying some packages, I found that TortoiseSVN does download, only it deletes the downloaded file just at the end of the download. ARG! I really don’t understand why this entire process has to be so complicated. This entire process should have taken half an hour, including downloading the code, modifying and initial testing. Why almost every time you download open source code, it never compiles on the first build. Why the SVN and CVS versions are different. I still like my idea of intelligent, learning RSS reader. If anyone has more knowledge in the mysterious ways of Sourceforge and wants to help, call. Comments Off on Why is Open Source so hard? I just accidently discovered this recently – you can get your email messages on Gmail as an RSS feed.